One of the clear signs that cryptocurrencies in general and bitcoin in particular have captivated the mainstream, is their appearance in popular TV shows, movies and art. There is no doubt that bitcoin especially has been the focus of mainstream media for quite a while and it has played an increasingly significant role in certain TV and movie genres. Bitcoin art on the other hand, has captivated the minds of many, particularly with the attempts to depict a coin in a manner taken from the core philosophy of realist art. Popular culture surrounding bitcoin has developed quite a bit, and as is expected, it has taken on many contemporary facets as well. Apart from digital art and illustrations, bitcoin is also a prominent theme dominating all sorts of memes. All these facets of popular culture in which bitcoin and other cryptocurrencies are playing a big role, not only show us how far they have made it into mainstream thought, but also offers a unique prism through which we can see the ideas that dominate popular culture. Many of these ideas are based on partial pieces of information that have been perpetuated as biases. TV shows for example, often portray bitcoin in a negative light. It is almost like if bitcoin was the 21st century villain. This is why the cryptocurrency is so prominent in TV shows and movies that belong to the crime fiction genre. Notice the miners of centuries past pitted against the bitcoin miners. Clearly the artist wanted to paint an encouraging picture of the future, in which dirty mining that damages the environment, is replaced by environmentally friendly bitcoin mining that augurs a more pleasant scenery. 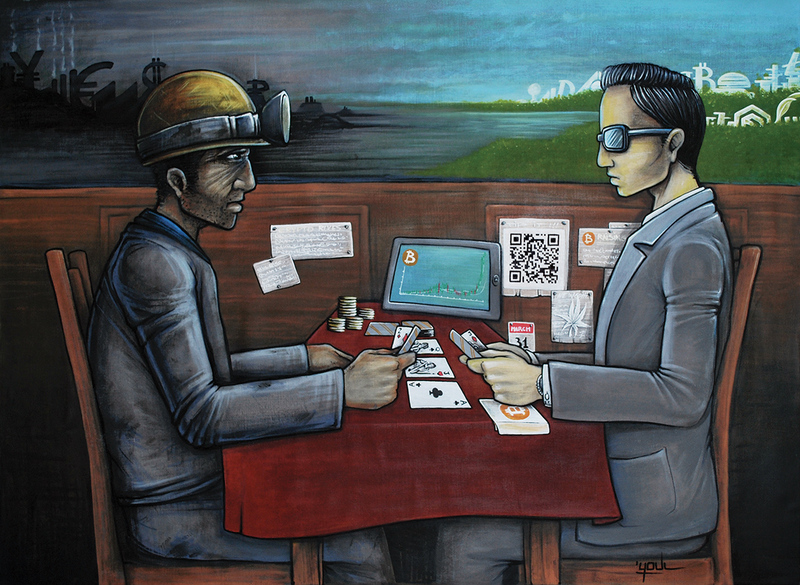 Both miners are engaged in a game of cards against each other, and this is the kind of imagery that many would be able to relate to when they hear about the clash between the old economy and the new. Since the cryptocurrency revolution is still in its infancy, references to bitcoin in popular culture will keep on growing. We have created this special section to track and even attempt to influence the way bitcoin is depicted in popular art. We will have special articles written about the subject, and we will also make an attempt at producing original pieces of art. We hope to generate greater interest in the subject, as well as cultural contributions from all our readers. Half of the world population are women, so why do women only make up 5% of those engaged in bitcoin? We look at the barriers women face in the crypto-sphere, and some women who have broken through despite these. A Drink To You, Bitcoin!